When I was serving in the celestial room of the temple last week, there was nearly an hour when I was completely alone in the room. This is a rare experience that can be had only by temple workers (or by custodians after hours), because the celestial room is never left unattended when the temple is open. The first time you’re in the celestial room alone is a surreal experience. There is no place on Earth where you can feel closer to God, but the spirit is shattered if there is even one other person in the room. When you’re there alone, it’s as though you have a private audience with Him, and it is absolutely awe-inspiring. So what was on my mind when I had that time alone there last week? I was thinking of the shuffling of playing cards — how magicians can be shuffle a deck not once, but several times, and then know with absolute confidence where any card is in that deck. Hey. I never said I was a spiritual giant. My distraction last week was not my fault. A friend gave me a terrific book, Fooling Houdini: Magicians, Mentalists, Math Geeks, and the Hidden Powers of the Mind, and I had just finished it before going to the temple that day. My mind was reeling with all the information in that book — not secrets to magic tricks, mind you, but all the work that goes into making them look magical. The reason I never understood that scripture was because of the word “small.” Every time I see a miracle, it has looked huge to me! I am constantly in awe of the things God does, and I never fail to think that they’re amazing. It was only when I read this book, however, that I realized how amazing those miracles are. I was able to see that by comparing them to magic tricks (which isn’t as sacrilegious as it sounds). Let’s go back a decade or two. A couple of times, Fluffy and I have found ourselves on a cruise ship with an amazing magician, Shawn Farquhar. This guy is the best of the best. He has a signature card trick that I’ve seen in person three times, and that I’ve watched on the internet countless times afterwards. If you want to watch it, here it is. 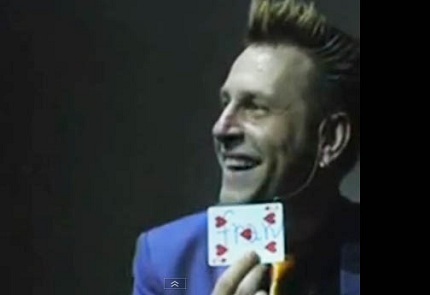 Shawn Farquhar, performing the most amazing of magic tricks. It won him the Magic Olympics in Beijing in 2009. Where I used to marvel, “How did that card get there?” I now wonder how many years it took the magician learn to use one hand to cut a card deck into four thirteen-card stacks and manipulate those stacks so the card would always appear where he planned it to appear. Contemplating the hours and weeks and months that each step of his trick took to master is far more of a wonder to me than the magic trick was in the first place. There is mathematics involved in magic — not elementary math that I can do, but physics. There is dexterity. Not only does the magician have to move his fingers quickly, but he also has to have a sense of touch so keen that it allows him to count cards by their feel or by their weight, and to do it instantly and unerringly. That alone takes years of training. He has to know psychology, because if you do it right the audience can look at something that is there without seeing it. And there’s a lot of mnemonics involved, too, because he has to remember the order of cards in a deck where those cards are in what appears to be a completely random order. Fooling Houdini followed the author for a year or so of his life as he learned these different facets of magic. The amount of study it took him to be able to do all these things at once was impressive. There such a huge array of knowledge and so much training that went into being able to throw a deck of cards into an audience, have several strangers shuffle the cards in succession and each take a card, and then be able to identify those cards from up on the stage. The spectators gasped in amazement, but there was a logical reason behind it all. And even though the author never fully explained his trick, by the end of the book I could see pretty much how it was done. I suspect that miracles are the same way. We look at them and say, “That’s a miracle!” But to call something a “miracle” is only scratching the surface — making it “small,” as Ether said. We never stop to think of all the knowledge that God must have to make miracles look that way. Some people may say that expecting God to do His miracles according to natural law limits God. I don’t think that’s the case. Just as magic seems even more wonderful when you see all the work that went into it, miracles seem even grander when we stop to consider a whole chain of actions that must have taken place in order for a miracle to come to pass. As I sat in the celestial room pondering the way magicians make their magic tricks look magical, I was overcome with the knowledge that God has of every facet of the universe He created. I was amazed that He goes to so much effort to make things come together in each one of our individual lives.